I eat about 100g/week of fish, mainly for the B12 and the Omega-3 fatty acids. When I first went plant-based, I didn’t think I needed to pay attention to any individual nutrients. I figured it’d all take care of itself. However, I’ve learned that B12 deficiency is common, and vegans on average have the worse Omega-6/Omega-3 intake ratios, and dangerously high homocysteine levels, behind vegetarians and non-vegetarians (best). So, I should probably eat at least 150g/week of salmon, since I’ll forget to take supplements. Vegans really need to take B12 supplements, and eat flax seed for the Omega-3 oils. Seriously. 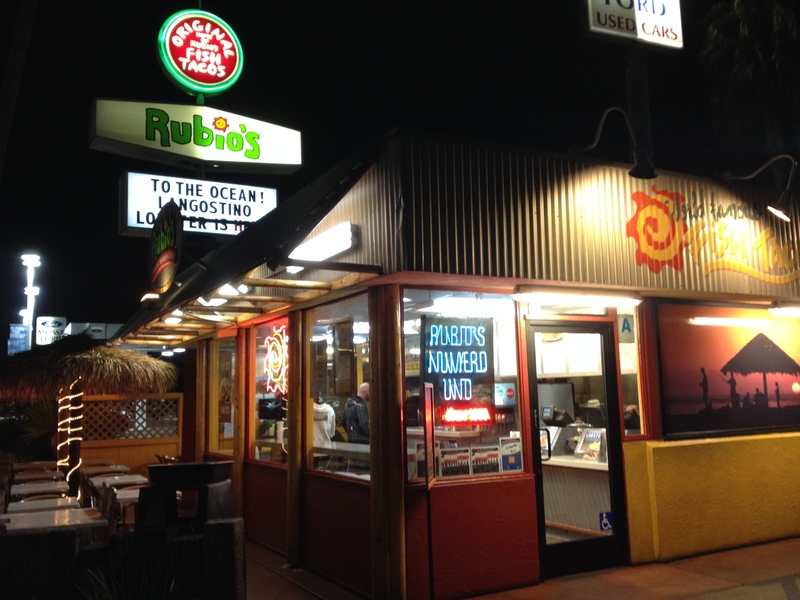 This is the original (“Numero Uno”) Rubio’s on Mission Bay Drive. I pick up a burrito after every spin class. Notice the “Langostino” they’re promoting? They kind of infer that it’s lobster, though I always thought it was crawfish. Turns out langostino is more closely related to the hermit crab, which isn’t an appetizing thought.